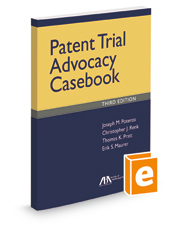 Published by the American Bar Association (ABA), Patent Trial Advocacy Casebook is perfect for anyone who wishes to impart patent trial basics, or simply wants to improve their skills in this arena. As trials become less common today, the need for teaching and enhancing trial skills increases. These course materials are the result of the authors' 15 years of teaching an advanced course in trial practice geared specifically to a patent infringement trial. This material had its genesis in a project for the American Bar Association and National Institute for Trial Advocacy as a program for practicing lawyers. Now in its third edition, this casebook has been refined specifically for undergraduate students at Georgetown University Law Center in Washington, D.C. The authors have now taught the course to several hundred undergraduate law students. Every aspect of these materials is focused on improving students' proficiency in one event: the trial of a patent case.